Germany, officially the Federal Republic of Germany, is a country in West-central Europe. Germany has one of the world’s highest levels of education, technological development, and economic productivity. Germany wears its riches well: elegant big-city charm, small picture-postcard towns, pagan-inspired harvest festivals, a wealth of art and culture and the perennial pleasures of huge tracts of forest, delightful castles and fine wine and beer are all there for the savoring. Germany is the world’s third largest economy by nominal Gross Domestic Product (GDP), the world’s largest exporter of goods, and the world’s second largest importer of goods. Germany is ranked fifth in the world in terms of purchasing power parity. The export of goods is an essential part of the German economy and one of the main factors of its wealth. As Europe’s largest economy and second most populous nation, Germany is a key member of the continent’s economic, political, and defense organizations. European power struggles immersed Germany in two devastating World Wars in the first half of the 20th century and left the country occupied by the victorious Allied powers of the US, UK, France, and the Soviet Union in 1945. With the advent of the Cold War, two German states were formed in 1949: the western Federal Republic of Germany and the eastern German Democratic Republic. The western Federal Republic embedded itself in key Western economic and security organizations, the EC, which became the EU, and NATO, while the Communist eastern Germany was on the front line of the Soviet-led Warsaw Pact. The decline of the USSR and the end of the Cold War allowed for German unification in 1990. Since then, Germany has expended considerable funds to bring Eastern productivity and wages up to Western standards. In January 1999, Germany and 10 other EU countries introduced a common European exchange currency, the Euro. Germany’s affluent and technologically powerful economy – the fifth largest in the world – showed considerable improvement in 2006 with 2.2% growth. After a long period of stagnation with an average growth rate of 0.7% between 2001-05 and chronically high unemployment, stronger growth has led to a considerable fall in unemployment to about 7% at the end of 2006. Among the most important reasons for Germany’s high unemployment during the past decade were macroeconomic stagnation, the declining level of investment in plant and equipment, company restructuring, flat domestic consumption, structural rigidities in the labor market, lack of competition in the service sector, and high interest rates. The modernization and integration of the eastern German economy continues to be a costly long-term process, with annual transfers from west to east amounting to roughly $80 billion. Germany’s aging population, combined with high chronic unemployment, has pushed social security outlays to a level exceeding contributions, but higher government revenues from the cyclical upturn in 2006 reduced Germany’s budget deficit to within the EU’s 3% debt limit. Corporate restructuring and growing capital markets are setting the foundations that could help Germany meet the long-term challenges of European economic integration and globalization. Germany has the second largest population in Europe (after European Russia) and is seventh largest in area. Elevation ranges from the mountains of the Alps in the south to the shores of the North Sea in the north-west and the Baltic Sea in the north-east. Between lie the forested uplands of central Germany and the low-lying lands of northern Germany, traversed by some of Europe’s major rivers such as the Rhine, Danube and Elbe. Because of its central location, Germany shares borders with more European countries than any other country on the continent. Most of Germany has a cool, temperate climate in which humid westerly winds predominate. In the east, the climate is more continental; winters can be very cold, summers can be very warm, and long dry periods are often recorded. Central and southern Germany are transition regions which vary from moderately oceanic to continental. 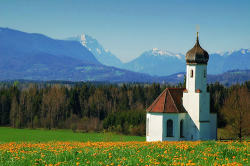 Germany is often called “the land of poets and thinkers”. German culture began long before the rise of Germany as a nation-state and spanned the entire German-speaking world. From its roots, culture in Germany has been shaped by major intellectual and popular currents in Europe, both religious and secular. German literature can be traced back to the Middle Ages and various German authors and poets have won great renown, including Johann Wolfgang von Goethe and Friedrich Schiller. Germany’s influence on philosophy is historically significant and many notable German philosophers have helped shape western philosophy since the Middle Ages. Germany claims some of the world’s most renowned classical music composers, including Ludwig van Beethoven, Johann Sebastian Bach, Wolfgang Amadeus Mozart and Richard Wagner. As of 2006, Germany is the fifth largest music market in the world and has influenced pop and rock music. Numerous German painters have enjoyed international prestige through their work in diverse artistic currents and Germany was particularly important in the early architectural modern movement, especially through the Bauhaus movement founded by Walter Gropius. Responsibility for educational oversight in Germany has to lie primarily with the states while the federal government only has a minor role. Optional kindergarten education is provided for all children between three and six years old, after which school attendance is compulsory for ten to thirteen years. Primary education usually lasts for four years and public schools are not stratified at this stage. In contrast, secondary education includes four types of schools based on a pupil’s ability as determined by teacher recommendations: the Gymnasium includes the most gifted children and prepares students for university studies; the Realschule has a broader range of emphasis for intermediary students; the Hauptschule prepares pupils for vocational education, and the Gesamtschule or comprehensive school combines the three approaches. In order to enter a university, high school students are required to take the Abitur examination, however students possessing a diploma from a vocational school may also apply to enter. A special system of apprenticeship called Duale Ausbildung allows pupils in vocational training to learn in a company as well as in a state-run school. Grundschule (Elementary school) can be preceded by voluntary Kindergarten or Vorschulklassen (preparatory classes for elementary school) and lasts four or six years, depending on the state. Hauptschule (the least academic, much like a modernized Volksschule [elementary school]) until grade 9. Realschule (in Saxony Mittelschule [middle school]) until grade 10. Gymnasium (Grammar School) until grade 12 or 13 (with Abitur as exit exam, qualifying for university). Gesamtschule (comprehensive school) with all the options of the three “tracks” above. After all of those schools the graduates can start a professional career with an apprenticeship in the Berufsschule (vocational school). The Berufsschule is normally attended twice a week during a two, three, or three-and-a-half year apprenticeship; the other days are spent working at a company. This should bring the students knowledge of theory and practice. After successful passing of the Berufsschule and the exit exams of the IHK, he/she receives a certificate and is ready for a professional career up to a low management level. In some areas the apprenticeship is teaching skills that are required by law (special positions in a bank, assistance of a lawyer …). Education is run at state level, not federal level. Therefore, there are many different school systems; however, in every state the starting point is Grundschule (elementary school) for a period of 4 years. In most of the 16 states, there are all of the kinds of secondary schools described above. English is compulsory statewide in secondary schools. In some states, foreign language education starts in Grundschule. Universities in Germany are part of the free state education system, which means that there are very few private universities and colleges. Private universities and colleges in Germany are generally less well regarded than public universities. German university students largely choose their own program of study and professors choose their own subjects for research and teaching. This elective system often results in students spending many years at university before graduating, and is currently under review. There are no fixed classes of students who study together and graduate together. Students change universities according to their interests and the strengths of each university. Sometimes students attend two, three or more different universities in the course of their studies. This mobility means that at German universities there is a freedom and individuality unknown in the USA, the UK, or France. The Gymnasium graduation (Abitur) opens the way to any university; there are no entrance examinations. The Abiturdurchschnittsnote (similar to GPA in the US, or A-Level results in the UK) is the deciding factor in granting university places; an institution may quote an entry requirement for a particular course. This is called numerus clausus (literally “restricted number”), but it generally only applies to popular courses with very limited places; for example a medical course could require an Abiturgrade of between 1.0 to 1.5. Yet another difference: while at Gymnasium a student cannot take courses that result in university credits. This might also have to do with the fact that the credit system is unknown in Germany so far, although it is being introduced with the Bologna process that is intended to unify education and degrees for all EU states. What counts at the end of one’s studies is a bundle of certificates (“Scheine”) issued by the professors proving that the required courses (and/or exams) were successfully taken. Life at German universities may seem anonymous and highly individual at first, but most students find a group of fellow students with common interests in their first year, and then often take courses together and study in this group up to the final exam studies. While there are curricula for the first two or three years in the sciences, in the liberal arts, every student picks the lectures and seminars he or she prefers (usually admission to the Zwischenprüfung requires three certificates, which may each be earned in one of several different seminars), and takes the exams at the end of the study period. Each student decides for him- or herself when he or she feels ready for the final exam. Some take the minimum 4 years, most take 5-6 years, some may even spend 10 years at university (often because they changed subjects several times). After 13 years at school plus maybe 1 year in the military, graduates may sometimes be almost 30 years old when they apply for their first real job in life, although most will have had a number of part-time jobs or temporary employments between semesters. If they have successfully studied at university for two years (after a Zwischenprüfung/Vordiplom), students can transfer to other countries for graduate studies. Usually they finish studies after 4-6 years with a degree called the Diplom (in the sciences) or Magister (in the arts), which is equivalent to a M.Sc. or M.A., or a Magister Artium. However, there is another type of post-Abitur university training available in Germany: the Fachhochschulen (Universities of Applied Science), which offer similar degrees as classic universities, but often concentrate on applied science (as the English name suggests). While in classic universities it is an important part to study WHY a method is scientifically right that point is not so important to students at Universities of Applied Science. There it is stressed to study what systems and methods exist, where they come from, their pros and cons, how to use them in practice and last but not least when are they to use and when not. To get on-the-job experience, internship semesters are a mandatory part of studying at a Fachhochschule. Therefore the students at U-o-A-S are better trained in transferring learned knowledge and skills into practise while students of classic Universities are better trained in method developing. After about 4-5 years (depending on how a student arranges the courses he or she takes over the course of his studies, and on whether he or she has to repeat courses) a Fachhochschule student has a complete education and can go right into working life. Fachhochschule graduates received traditionally a title that starts with “Dipl.” (Diploma) and ends with “(FH)”, e.g. “Dipl. Ing. (FH)” for a graduate engineer from a Fachhochschule. The FH Diploma is roughly equivalent to a Bachelor degree. An FH Diploma does not usually qualify the holder for a Ph.D. program directly — many universities require an additional entrance exam or participation in theoretical classes from FH candidates. Due to the Bologna process the bachelor and master degrees are introduced to classic universities and universities of applied sciences in the same way. Degrees: Most courses lead up to a diploma called Diplom or Magister and these are equivalent to the Masters degree in other countries (after a minimum of 4 to 5 years). The doctoral degree usually takes another 3-5 years, with no formal classes, but independent research under the tutelage of a single professor. Most doctoral candidates work as teaching- or research assistants, and are paid a reasonably competitive salary. This is different in medicine, where an M.D. is (effectively) required for work and hence a more streamlined process applies. Recently, changes related to the so-called Bologna-Agreement have started taking place to install a more internationally acknowledged system, which includes new course structures – the (hitherto unknown) Bachelor degree and the Master degree – and ETCS credits. These changes have not been forced on the universities and the hope has been that they will develop them from the bottom up. So far, students have been reluctant to start these new courses because they know that within Germany, employers are not used to them and prefer the well-known system. In the winter semester of 2001, only 5% of all students aspired to complete either a bachelor or master degree, but this has changed as many universities and universities of applied sciences change their course offerings to exclusively provide only bachelor or master degree certificates (e.g. Bremen or Erfurt). In addition, there are the courses leading to Staatsexamen (state examinations), e. g. for lawyers and teachers, that qualify for entry into German civil service, but which are not recognized elsewhere as an academic degree (although the courses are sometimes identical). All courses at the roughly 250 classic universities and universities of applied sciences are – like any school in Germany – free. One might also say the government offers a full scholarship to everyone. However, students that take longer than the Regelstudienzeit (“regular length of studies”, a statistically calculated average that is the minimum amount of time necessary to successfully graduate) do have to pay Langzeitstudiengebühren (“long-time study fees”) of about 500 EUR per semester, in a growing number of states. Today there are a few private institutions (especially business schools) that charge tuition fees, but they don’t have high recognition and high standards as public universities have. Another negative impact of the private institution in Germany is that they usually have only one or few subjects so that they can’t get high recognition in international competition. One does have to pay for one’s room and board plus one’s books. After a certain age, one must obtain obligatory student health insurance (50 EUR per month), and one always has to pay for some other social services for students (40-100 EUR per semester). Students often enjoy very cheap public transport (Semesterticket) in and around the university town. There are cheap rooms for students built by the Studentenwerk, an independent non-profit organization partially funded by the state. These may cost 150 EUR per month, without any food. Otherwise an apartment can cost 500 EUR, but often students share apartments, with 3 or 5 people per apartment. Food is about 100 EUR (figures for 2002). Many banks provide free accounts to students up to a certain age (usually around 25). There are no university-sponsored scholarships in Germany, but a number of private and public institutions hand out scholarships, usually to cover the cost of living and books. Moreover, there is a law (BAFöG or Bundesausbildungsförderungsgesetz) that sees to it that needy people can get up to 550 EUR per month for 4-5 years if they or their parents cannot afford all the costs involved with studying. Part (typically half) of this money is given as an interest-free loan and has to be paid back. Many universities planning to introduce tuition fees have announced their intention to use a part of the money to create scholarship programs, although the exact details are mostly vague.